The Philadelphia Baseball Review released its College Player of the Week awards for the period ending April 1. 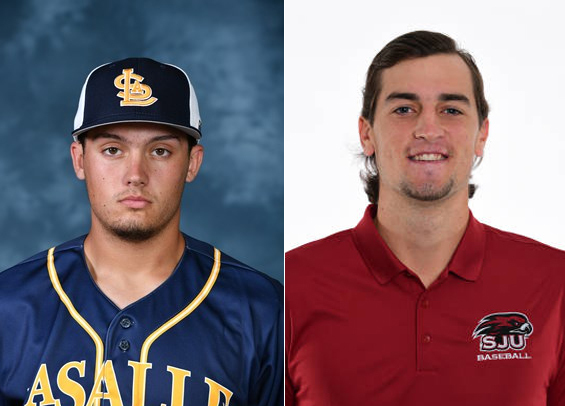 La Salle junior first baseman Ben Faso was named the Philadelphia Baseball Review's Hitter of the Week, while Saint Joseph's junior right-handed pitcher Tim Brennan was named Philadelphia Baseball Review's Pitcher of the Week. Faso finished the week for the Explorers 5-for-16 (.313) with a double, a stolen base, and nine RBIs. This is the second time the Media, PA native has won Player of the Week honors. Brennan hurled eight strong innings for the Hawks in a 12-3 conference win over La Salle, surrendering three earned runs on six hits. He walked a pair and struck out eight. Brennan was last named Pitcher of the Week by the Philadelphia Baseball Review on March 19. Over six starts this season he's 4-2 with a 3.73 ERA.